A series of short articles asking some of the awkward questions that we never seem to ask? No 1: Why do we stick our heads in the sand? In my career to date there are a number of incontrovertible truths that I have come across. 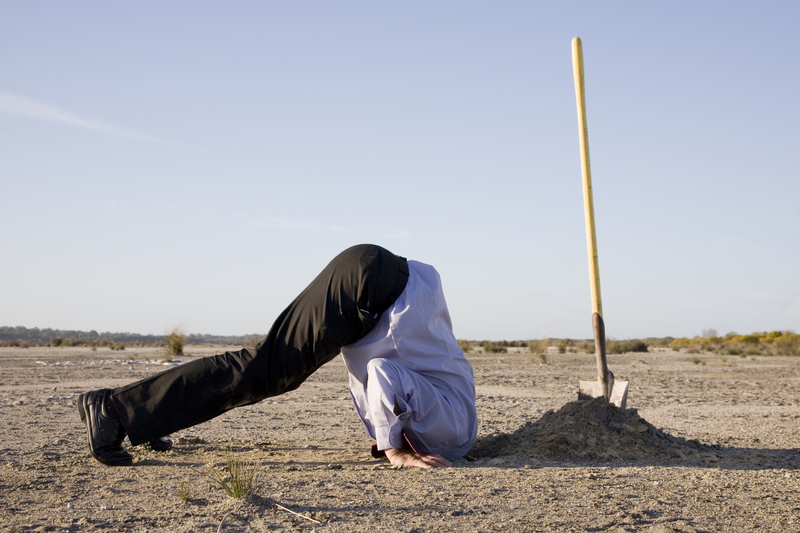 One of the truths that will rise to the surface regularly is that businesses have a tendency to stick their heads in the sand and ignore the warning signs, or worse, the history of their business and its revenue trends. An example: The historical revenue trend for company X says that we’ll have a dip in core revenues across the Christmas period and again in the height of summer. So, we build this into our plans and forecasts and lo and behold we hit our numbers in those months. Yippee! However, we also know from history that either the preceding or following months can also suffer with lower than acceptable performance and when we analyse this we cannot attribute it to any specific seasonal factor, other than …. “Our salespeople have taken their foot off the gas and it will take a few weeks to get back up to speed”. Or the blame game version “Our customers are still on vacation” or even, the market isn’t buying! On the theme of vacations, why is it that the salesperson is surprised when the deal they were waiting on, you know the one, the big one, the dead cert, the one that was going to make his year, stops dead in its tracks! As a result the sales number is missed big time and when challenged, the response is, “the decision maker has gone on vacation”. Why didn’t we know that this was likely to happen? It’s vacation season after all! So why don’t we take the time to ask the questions that would help us understand the buying process steps along with its twists and turns, or invest in advance in the selling activities that will help stop these periods from being problematic? A classic case is summer vacations and post-summer “Back to School” periods. Why is it that in B2B selling we don’t routinely invest in making sure our sales teams are refreshed, renewed and refocused for when they get back from their summer vacation? Or use the tools that we use at other times of the year to manage the pipeline flow effectively or use the skills we’ve been taught over and over to be able to ask the awkward questions? This entry was posted in Achieve target, Exceed Target, Leadership, Sales Excellence, Sales Performannce, Think different, Uncategorized and tagged awkward questions, summer vacation, summer vacations by ellis mugridge. Bookmark the permalink.